Some of you know how obsessed I have become with my green drinks, and most of you think I’m crazy for it. Green drinks look nasty, and sometimes taste nasty, and with so many possible ingredients, it can be daunting to know where to start when deciding to venture into drinking greens. Green drinks have monumental benefits, and there are easy ways to make them taste great! 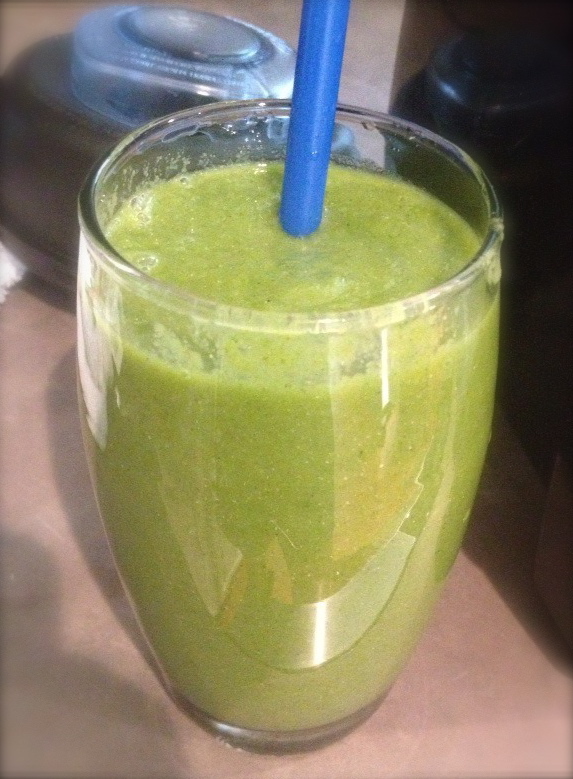 Below is a recipe for a simple, delicious, and highly nutritious green drink! Place all ingredients in a blender; blend until liquified. Add more organic plain coconut water to reach desired consistency. While many health fans prefer juicing to blending, that process actually removes most of the pulp, which is one of the most nutritious parts of the drink! This recipe results in a drink with a smoothie texture. Kale: Claimed to be one of the healthiest superfoods on the planet! It is high in calcium; vitamins A, C, and K; as well as copper, potassium, iron, manganese, and phosphorus. Parsley: High in vitamins B-12, A, C, and K, which promotes a healthy immune system. It also flushes excess fluids from the body, detoxifying the body and supporting kidney function. Parsley also helps reduce blood pressure. Green Apple: Good source of fiber, and also helps reduce blood pressure and stabilizes blood sugar. And it’s what makes the green juice taste amazing! Chia Seeds: These are a magic food gaining popularity for their ability to fight disease and promote a healthy heart; their high level of fiber, protein, Omega 3 fatty acids, manganese, and phosphorus; and, of course, their belly fat-fighting power! Coconut Oil: Another magic food that has hundreds of healing, anti-bacterial, skin-protecting, and nutritional benefits! It also increases energy and helps burn fat! This multi-beneficial ingredient also gives a sweet, creamy texture to this green drink! Gelatinized Maca Powder: It is very important to make sure you use “gelatinized” versus “raw” maca powder. Raw maca powder is most commonly used in baking, and is dangerous to consume without being cooked. Therefore, gelatinized maca powder is the way to go! It helps balance hormones; increases fertility; reduces stress; and energizes like caffeine, but without the bad effects! B-12: This is another supplement that has grown increasingly popular, especially because it is very important to add to vegetarian and vegan diets, as it is usually found in foods such as meats, dairy, and eggs. B-12 increases energy; helps regulate the nervous system (related to depression and anxiety) and the digestive system; promotes healthy skin, hair, and nails; and helps fight certain cancers, such as breast and colon cancer. Plain coconut water: High in electrolytes, highly hydrating, and high in potassium and B vitamins. Ginger Root: Ginger root has long been used to aid digestion and is known to have antioxidant and anti-inflammatory effects. Lime Juice: Limes are known to be anti-carcinogenic, to prevent kidney stones, and to lower cholesterol. Plus, it makes this green juice taste so much better than it would without it! Feel free to get creative and play around with the ingredients! When you come up with your favorite green drink, share your recipe here!